Dèesse Magazine: Valentines Day Treat !!! - Mini Magical PixieDust Gift! Valentines Day Treat !!! - Mini Magical PixieDust Gift! 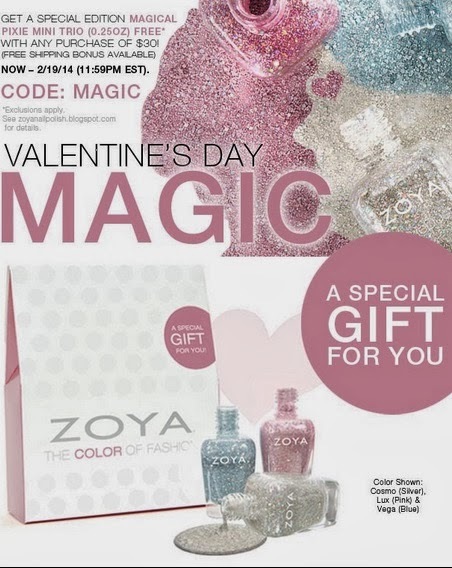 This Valentine’s Day Zoya Nail Polish wanted to bring a little magic to your life, so we they have a very special gift just for us polish loving Pixies! Here’s a hint… it’s prettier than flowers, sweeter than candy and shines just as bright as diamonds. Give up? It’s a LE Zoya Magical PixieDust (holographic textured) Mini Trio! BONUS – Spend $35 or more for FREE Standard Ground Shipping! 1. Add $30 or more of Zoya, Qtica or Qtica Smart Spa products to your shopping bag. Don't forget - if you spend $35 or more, shipping is FREE! 2. Enter Code MAGIC into the coupon code field in cart and press "Apply Code" (Magical PixieDust Mini Trio will automatically be added to the bag). Valid online only at www.zoya.com and www.qtica.com through 02/19/14 (11:59pm EST) OR while supplies last. Not valid in conjunction with other coupons, codes or promotions. Continental US only. Excludes Color Spoons. Art of Beauty is not responsible for incorrect addresses, credit card entry errors, web related issues or any errors associated with declined credit cards. Returns or exchanges of promotional items not permitted. Code must be entered at time of purchase. One code per account - code cannot be reinstated for canceled orders. Please allow up to 2 weeks for processing depending on volume.